Lately in the los Angeles area there have been a number of new lacquer and pre-catalyzed lacquers hitting the market, some good some not so good, some inexpensive and others not. Being the “Prove-it-to-me” kinda guy that I am, We decided to test them all out and see how they stood up to a few the industry standard tests. 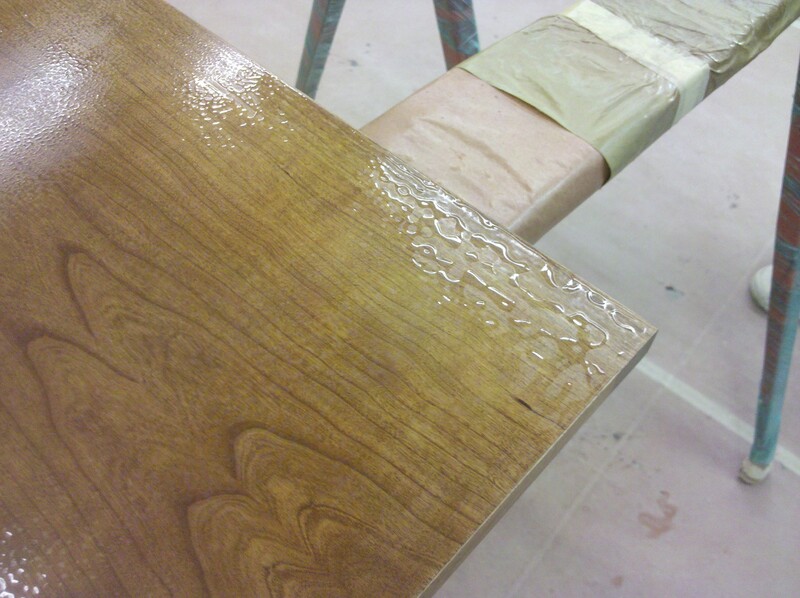 The first thing we did was a spray out of 5 different Pre-Catalyzed lacquers over both a stain and raw wood. How well did they go on? how fast did they dry? How good do they look in the end and most importantly how tough are they,were the questions we wanted to know the answers to. Inexpensive is good but if the customer calls you in 6 months and you have to go re do the work saving 5 dollars a gallon just cost you two hundred in time and labor not to mention damaged reputation. The place to save it is not on the coating. Pre-catalyzed lacquers were designed to hold up better in water and wet areas like the kitchen and bathroom. PRe-Catalyzed lacquers are self sealing, but work best with a vinyl sealer. For out little test we didn’t use a sealer, but for a kitchen or bathroom I wouldn’t skimp on that. All of the panels were sprayed the same. there was no effort to throw the results one way or the other. It is my effort and propose of the this blog to properly and accurately educate finishers on the subject of finishing. My self and my fellow sales associate, Martin Gonzales, are train finishers and are more they willing to come out to your shop to demonstrate our products and train your staff on proper techniques for getting the products efficiently and effectively for your customers. feel free to call the store and ask for a demonstration. I have been reporting on the acrylic lacquer for the last few years yet few of the die-hard finishers have taken up the new technology, for better or worse in our industry getting up and running with a new product, water-based materials or other wise is a trying activity experimenting with you customers kitchens is a risky business and with economic conditions as they are these aren’t the times to venture away from the norm, or are they? Having a technologically superior product that is easy to apply could be the thing that would put you ahead of the crowd could be the ticket to your survival in this cut throat market. 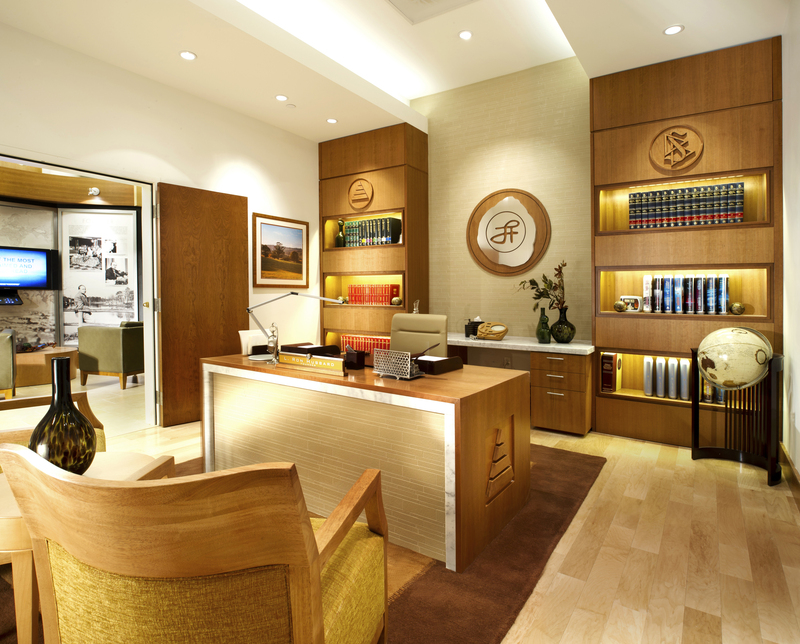 The Church of Scientology has been on a project to up grade and renovate their various facilities around the country. After extensive testing they decided on using the Centurion acrylic Lacquer from CIC Coatings they needed something that was commercial grade tough and as well crystal clear which wouldn’t yellow. As well they wanted a product that was as environmentally friendly. The CIC Acrylic lacquer met all these qualities It doesn’t yellow as it is not nitro-cellulous, it’s as hard as a pre-Catalysed lacquer yet it has the moisture resistance of a urethane, it is low VOC and has a relatively low odor. The Finishing contractor, Jody Toole, of Jody tools Finishing (http://www.jodytoole.com/) has been applying the product with an Kremlin Air assisted Airless spray rig has been over joyed at the results he has been getting. the following are a few pictures of one of the recent Church of Scientology churches which have been renovated using the CIC Acrylic lacquer. I have been using the CIC conversion varnish now for over a year and have been very impressed with both the product and the manufacture. There are a few things to know about this product that I have come to learn over the course of the last year of handling the material that I wanted to pass along. One of the values of this Blog is that I can document the things I have to tell people over and over, I’m sure that I’ll continue to go into shops and explain the same thing to people but it helps that I can refer people to an article on the matter. So now, all these things work together, the various components of a coating have different chemical properties and different tolerances. You can only put so much pigment in a clear lacquer before you have gone too far and your final product will be chalky and flat or might not stick because there is too much of the dye powder and not enough of the binder to hold it all together. The same goes with solvents you can thin down a lacquer with lacquer thinner to a point where there is not enough binder and the chemicals no longer work together. Think of a bag of concrete add a little water and you have a drive way, too much water and you have a mud pit. An orange peel so bad you don’t know what you are looking at. What has happened here is that there is too much water and so the binders can hold it all together. This project had to be stripped down and re-done. 1. The first thing you have to do is have the right equipment, if you are trying to spray a water based product with a small tip size then you will be forced to over thin the material to get it out of the gun. Your regular lacquer and automotive gun is usually a 1.4mm which is too small. I have use a 1.7 mm tip in an HVLP cup gun with success but prefer to use a 2.0 mm. The Centurion works great out of an airless or better yet the air assisted airless, don’t use the extra fine tip as you might “Sheer” the material (a term use to describe what happens when the material is subjected to too much pressure) your finish will come out grainy as if you had fine sand al through your material. 2. The next thing to do is make sure that you material is not cold, the warmer the material is the more fluid or less viscous it will be factually for every 10 degrees warmer your lacquer (water based or solvent ) will be 10% thinner. That mean that if you leave a bucket on the concrete floor of your shop and overnight it cools the material down to 50 degrees, you can make it 20% thinner by warming it up to 70 degrees. Now you can reduce your labor by warming your materials as you won’t over thin the stuff and have to put on more coats to make up for all the thinner that is going to evaporate on you. you would also be saving money on thinners as well. if you are using water based materials, water is cheap Labor however is not. 3. Sill a little lumpy with your gun spitting material instead of laying on and even coating… thin it another 5%. 4. If it is still lumpy and or not flowing out at this point it to add a small amount of retarder. Here is an example of that scenario this is a Centurion Conversion varnish that has been tinted Brown, with the all the Pigment the materials are not flowing out. Looks pretty crappy: what solved this was adding lacquer retarder. A mixture of 50/50 water and glycol either EB: Lacquer retarder. If you get the MSDS and it say the primary ingredient is glycol either EB then you are set. A.G. Layne, Sunny side, CIC and other manufactures have retarders that are primarily Glycol EB, Any retarder when mixed 50/50 with water and goes into solution will work. In the first picture above, the walnut the job. The containers of conversion varnish that has been over thinned were allowed to thicken up by letting some of the excess water evaporate off and then they were retarded with the above mentioned 50/50 mix of water and retarder and the job came out fine. If done correctly you’ll have a rock hard finish that is as smooth as a good nitrocellulose lacquer finish. Ok, That’s my story and I’m sticking to it of you have questions feel free to send me a line. New rules re: lacquer thinners from the AQMD. What this means to the consumer here in southern California, you now have to buy the legal stuff, further more, there is wording in the new ruling stating that you have to keep records of where you bought your materials and the retailers from whom you bought your materials have to keep record of who they sold materials to. There is a grace period where retailers and manufactures can sell off the stock they have of the materials manufactures in 2009. However there is language in this ruling which targets the retailers with fines as well as the end users for supplying solvents that are no longer legal. Previously, the AQMD only targeted the end user, now however they are getting tougher on retailers who sell non compliant materials. I called around and ask the managers of a few other paint stores in the area and they knew nothing about the matter, while they may not get hit with this right away they are potentially subject to fines. ANNEX PAINT store is now stocking compliant lacquer thinner. We have two manufactures who have compliant thinners and have a lacquer thinner that is now less expensive than the old thinner was. So far the reports I have gotten back on the material are that it is working OK, the true test is going to how well it performs in the California Summer. Worthy of note on the subject we now have a new compliant glazing liquid to replace the naphtha which a lot of shops have been using to make there own stains with, the Naphtha now being and illegal solvent. This product has been a real success as it can be used in-between lacquer coats and will not lift the earlier treatments. This is a key element when you are building a multi step finish. If you have comments on the new compliant thinners I would like to hear from you on how well it performs. What is the best finish for my Kitchen? Since I have had this blog up I have had numerous calls and emails from homeowners and professionals alike asking what is the best finish for my kitchen? Some go on to say things like my contractor wants to put Valspar luster lac on but my architect tells me that we should use polyurethane and my neighbor say use water base. What do I do? The simple answer is have all these people give you samples of the finish not only should you ask for a sample but have them do a sample on the same wood and materials that you are going to have in your kitchen: alder, cherry, maple or what ever. Then have them use a door or a cabinet from your kitchen. If you have to pay a little for it you should. A real good finishing job is expensive and worth it using multiple steps in the finishing process you can gain a depth and clarity that you don’t with the lower quality finishing. By survey, a well painted room or a high quality cabinet finishing job will make a room “feel different” the untrained person coming into the room will feel more comfortable and will prefer the room with the higher quality finish to the room with the lesser quality finish. The technology behind this is the fact that consciously or not a person does perceive imperfections and they will make you feel to one degree or another uncomfortable. The same thing is true when you go into a room that is off square and a room that is perfectly square even when the rooms are identical in every other aspect by test, most people will “like” the square room better. Not all things are square, nor do you always want square. The point being that people can perceive the difference in quality and workmanship, when the difference is not as obvious. Ever notice the phenomena of seeing two similar looking products you pick up the more expensive one? I’ve digressed; a good finish is worth the extra cost. That being said, what are the differences and the pros and cons of each. Nitro-cellulous lacquer– The easiest to apply; it gives a great look and feel. All regular lacquers will yellow over time, some faster than others. Valspar has been notorious for that. Regular lacquer is relatively soft and will not hold up to moisture. But feel great and therefor it is not good for kitchens and bathrooms. Lacquer finishes are easy to repair as each successive coat of lacquer melts into itself. Pre-Catalyzed lacqueror Pre-Cat lacquer, designed about 50 years ago as a material that would hold up to moisture environments better, the kitchen and bath rooms. Pre-cats have an acid catalyst in the mix that makes it a lot harder and yet it is still relatively easy to work with. Pre-Cats are what you should have in your kitchen but they have a tendency to crack if applied too heavily and they are not impervious to moisture. You have to wipe up spills and not let the dish water sit in the crevices and cracks of a cabinet door. Give that door a year with a daily dose of water sitting on it not cleaned up and the coating is going to fail. You do have to clean up after your spills. If you don’t like that Idea, hire a maid or go with stainless steel. The Pre-Cat lacquer brand I like the best is Gemini. It is thick and yet can be sprayed directly out of the can dries quickly and looks great. Water based lacquers– they have come a long way. They have had a tendency to have a “plasticie” look as the materials lay on top of the wood rather than soaking in to the wood as a lacquer does. One person I know refers to water base materials as nothing but watered down Elmer’s glue. 20 yeas ago that was about what a water based finish looked like. Times have changed and the water bases of today are far superior to what they were. Old time finishers who haven’t taken the time to train themselves on how to properly apply the materials still cling to their earlier fixed Ideas on the matter. The truth is that properly applied a water based finish can look just as good as a lacquer finish and is twice as durable as lacquer when it comes to moisture. The trick is in knowing how to apply it and letting the water based materials fully cure. Cure is different than dry. The materials will dry in a few minutes and then take a week or two to fully cure. The other up-side to water based materials are that you are releasing toxins in to the atmosphere don’t however think that water based materials are with out carcinogens. There are lots of nasty chemicals in water based paints they are just not being released into the atmosphere as are the lacquer products. Personally I have a few water based materials that have proven them selves; the Gemini brand “Titanium” and more recently the Italian brand Renner. The Renner is hands down the best water based material I have found to date. Like a Lamborghini however, it’s pricy at $210 for five gallons as apposed to the $170 a five for Gemini Water based lacquers. Water based conversion coating; This is a new product to the market that I’m beginning to really like. It combines the best of both worlds. There aren’t many companies that make it. Rexcel is the brand I have, American made and comparable to the solvent base stuff. You can see other articles in this Blog about it. Very tough and moisture resistant (see the earlier article I wrote where I have pictures of the panels coated with the Rexcel in my shower stall getting the extreme moisture test. The panels have been in there for over two months with two or more showers happening a day and there is no signs of failure in the coating. This particular product needs no further catalysing which makes it very painter friendly. Polyurethanes, Water based and other wise, these are the toughest finish that you can get and the most expensive. One part polyurethanes or single stage that have not catalyst aren’t really worth the effort of buying. Most polyurethanes come with a catalyst you have to add before applying similar to epoxy glue, there is a part A and a part B. you have to get the ratios right or it either won’t dry or will dry and crack. They generally sit on top of the wood as a coating and so give it that plastic film look. It’s tough to glaze in-between coats and which is the technique that gives you that depth and quality. There are some really good finishers that can pull the off but normally for the expense that is not something you need for your house or kitchen. This is the product I recommend for commercial applications that is getting high wear and constant abuse. Additionally If you want shinny you can buff and polish polyurethane to a high gloss that is mirror smooth. To give you an idea, polyurethanes are the coatings you put on your floor, that’s the toughness you get from a poly. If you want a high build thick film that you can see this would be the product to use as you can lay it on thick unlike Lacquers. There are water based polys and solvents based, I carry both. I wouldn’t recommend doing you kitchen cabinets in polyurethane, that being said I have some very high end finishers who have perfected the skill sets and can product incredible products with polyurethanes. These finishing procedures come with a cost. “Thomas Craven Finishing Company” are at the top of their league for high end work. So what should you have your kitchen done with. Get the samples and look at them. see the look that you like and then decide what you are willing to pay for it. If you are a Hollywood celebrity, have lots of parties and don’t clean, go with the polyurethane. If you are a regular family and are looking to cover you new custom cabinets with something that will preserve them for a long time to come use a Pre Cat lacquer or the water based conversion coating or perhaps the conversion varnish depending on what looks the best for you. Either way get your finisher to provide you with samples so you can see the difference yourself. Finishers are usually creatures of habit and like to do what they have done and feel safe with. Often an old school finisher will tell you something is bad because he has no clue how to use it and doesn’t want to learn. I enjoy your comments suggestions and opinions. Acrylic Lacquer: A new, low voc clear coating for wood. No two finishing lines are exactly the same. Nor are the finishing standards or production goals identical from facility to facility or shop to shop. To satisfy a wide range of variables relating to application, curing, finish durability, appearance, environmental requirements, “green” sustainability initiatives, and cost, I have been on a constant search for the different coatings out in the market. To this end we have brought in yet another product for our customers to use. First of for those who may not be familure with some of the other products that are generally use in the world of finishing to day. Nitro cellulose Lacquer, the basics. Nitrocellulose lacquer is made by mixing fast-drying solvents generally know as lacquer thinners with wood and cotton pulp containing cellulose that has been broken down by acids. A chemist working for the DuPont Chemical Company, is credited for inventing nitrocellulose lacquer in 1921. It was quickly picked up by Henry Ford for his mass-produced automobiles because finished cars could come off the assembly line faster. Not long afterward, nitrocellulose lacquer replaced shellac and oil-based varnishes and became the preferred finish and the industry standard for furniture and cabinet manufacturers. : nitrocellulose lacquer is relatively inexpensive and dries quickly. The cured resins provide a reasonable protective layer of film over the wood. After the hard film cures, it rubs out well and provides it signature smooth and silky surface that, Also, because it is an evaporative finish, each new coat of lacquer blends into all the previous coats, making it easy to repair. Because it dries so quickly, when applied under conditions of high humidity, the lacquer film can trap condensed moisture and cause the finish film to appear cloudy — a problem referred to as blushing. You can overcome that finishing obstacle by adding a slower-drying thinner, called a retarder, which allows the moisture to escape before it gets trapped in the film. The need for something that doesn’t yellow and has a greater moisture tolerance. With the increased popularity of using unstained, light-colored woods (such as ash, birch, and maple), woodworkers and furniture manufacturers wanted to avoid the yellowing problems associated with nitrocellulose lacquer as it ages. The finishing industry responded by developing lacquers containing acrylic resins that are truly “water-white.” Acrylic resins go on crystal-clear and stay that way over time. The most widely used of these products is called CAB-acrylic lacquer, made with cellulose acetate butyrate and acrylic resins. : it is best applied by spray equipment, diluted with regular lacquer thinner to obtain the ideal spraying viscosity, and it is fast-drying. Acrylic lacquer is often used as a protective topcoat over colored pigment lacquers to make them wear better and to enhance their resistance to scratches. Renner the Italian wood coating manufacture has long provided me with exceptional water based products wanted to get into the American nitro cellulous lacquer market and released their “JL” series 161 VOC acrylic lacquer. Why they had to go and name it like that is beyond me, I would have preferred a snazzy marketing name that I could refer to it as, but, oh well. Low VOC, more environmentally friendly and you can reduce it and still be compliant; a word of caution though, over thinning it has caused problems. Suggested total amount you thin it is not more than 5%. Low Odor, It does have a smell but it’s not half as bad as other products. Self Sealing, You don’t need a different product to seal this with. Best practice is to lay down two thin coat and then sand it as if it were a sanding sealer. Non-Yellowing, what else do you say this doesn’t yellow as any regular lacquer or Pre catalyzed lacquer will. 18% Solids, this is a term that a lot of people don’t get but is a very important datum when evaluating a coating. Basically it’s thicker and so you get more square foot coverage. For reference the most common lacquer on the market is 11% solids it’s cheaper but you have to spray twice as much. For most shops there labor is more costly than there materials and so the few buck you save on materials ultimately cost you more in the long run. Don’t over thin it. With a lacquer thinner, you can thin it 5 or 10% but not beyond that it will blush and do strange things. In essence when you thin some materials you are trying to increase the viscosity and make it come out of your spray gun better. If you over thin it you begin to alter the chemical make up and that is where you get into problems. Don’t apply it over another manufactures sealer. A, you don’t need to use a sealer and B, the acrylics are not compatible with the lacquers when you do this the nitro-cellulous in the earlier coating get re-wetted and then reacts with the acrylic resins and does weird stuff. I now have several large manufactures using this product and having great successes with it. If you are interested in this product give me a call if you have had successes or failure with this product I would like to know about them. One of the things I have learned in this business is that you test always. The greatest test of a coating is the test of time. How long did it last and where? I thought I would post an Email that was sent to me with a very valid question. Water Based polyurethanes versus Solvent conversion Varnish. Which is harder which is better? I am in the process of building some pantry cabinets for my shore house. I want to achieve a nice solid white finish. What would you recommend. I was thinking a white tinted conversion varnish applied w/ a hvlp conversion gun. Any other suggestions. I just need it to be more durable than paint. My other option was to paint then apply a waterborne polyurethane coating. You have several options. But what I would recommend is the water born poly or similar product. The conversion vanish is great stuff but is very tough on both the people who spray it and your equipment. The acid catalysis is rough on a body, if you do use it get a spray suit with a hood and wear a respirator. It does produce an incredible finish and fast. On the up side to the conversion varnish it is slightly clearer, but you are not doing a clear over a wood stain so that wouldn’t be a significant issue. The down sides to the waterborne poly is it is a little trickier to spray and requires a larger tip size usually 1.7mm or bigger and you may need to experiment around first to get it to lay down smoothly, you may require a certain amount of retarder so that it will lay out smoothly, 3% is all you would want to add after that it will take forever to dry and will compromise the hardness. Once you have your solution dialed in its pretty simple. I would get a good white primer on first otherwise you will be putting on more coats of the poly that you really need and they are harder to sand. Ellis 1262 water based white primer is a great one. Ellis is however a La company I don’t know where you are. Dunn Edwards and Sherman Williams both make decent primers; a good primer will save you time and money. Get the surface as smooth as you can with the primer then two top coats and you are done. Don’t get a water based poly from Home depot or Lowes the “Minwax” polyurethane they sell isn’t that good and doesn’t do that well. I would get something used by professionals, Renner is what I sell and I love the stuff this is an Italian manufactured material. Of course there are others that are very good as well. “General Finishes” have a few. I have an incredible product that I really like that is somewhere in-between a water based poly and a Conversion varnish. It is manufactured especially for us by a company called Rexcel I have mention of it on my Blog. If you go to the Blog you can see the Rexcel listings I have there as well as the test I am running with the material. I have three panels I shot my self that are in my shower getting wet daily. So far they have been there a month and show no signs of water damage. Anyway, that product is interior/exterior and harder than hell, you can also buff it to a mirror finish and is only about 54 bucks a gallon if you are interested in having some shipped. We can do that. We have it white I believe, the one thing about white is there are several whites so you might want to do some testing first. You can also send us a color sample and we can match it. If you do that you have to provide a board with the color of your choosing that is at least 6”X6” that way we’ll have some thing to work with. Let me know what you decide and how it all comes out. If you are interested send some pictures with a little write up and I’ll post it on the Blog. There is currently one posting from a guy that did his own kitchen with a water base lacquer and it turned out great. You should read that one as well as there are a few tips in there that are Key. One of which is the fact that all water base materials take longer to dry and longer to Cure. You have to let them cure for a few weeks before they get really hard. You can install them after a day or two but be very gentle with it for at least a week. The Conversion Varnish goes hard with a chemical reaction and will continue to cure for days and weeks but will get harder faster than the water based materials that cure at the rate of water evaporating. That by the way is determined by temperature and relative humidity. You can force dry then with heat and air flow but don’t cook them. You got me on a roll here, did I answer your sufficiently? I welcome your comments and suggestions and I would like any feed back as to how this information was of use to you. as well I welcome your questions on the matter. If you would like to contact Thomas Craven directly you will find His shop address at the bottom of the article along with his web site address and Email information. All spray systems attempt to achieve one thing, that is atomization. Atomization from the dictionary is to, “reduce to minute particles or to a fine spray”. Whether you chose conventional, HVLP, or airless spray equipment, they all achieve the same thing; that is atomization. A satisfactory finish is produced when the spray material is atomized to the point that the material will flow onto the surface and become a uniform and even coating. Viscosity and pressurization are the two main factors that effect proper atomization. I looked up the definition of viscosity in the dictionary and found it to be just as hard to understand as the name itself. So I will tell you my definition of viscosity as it relates to spray finishing. Are you ready for it; it’s how thin the material is! Correct atomization occurs when the material being sprayed is just viscous or thin enough that the pressurization provided by the spray equipment in use can break up or vaporize the particles to produce a satisfactory coating. You only thin the material down enough so that your spray equipment will atomize the material while producing a coating that flows out onto the surface. Thinning the material too much will leave a coating that is spotty and runs down vertical surfaces. A coating too thick that is drying to fast will give you dry, rough areas and orange peel. the material. Or in the case of airless spray equipment, it is the pressurization of the material itself in the spray line that is then forced out the front of the gun through a very small orifice or spray tip that causes atomization at the front of the gun. Conventional– High-Pressure, Low-Volume air spraying is out dated technology. Rarely in use in California any more. Produces a lot of overspray and hence wasted material. Material is presented at the front of the gun where air ports in the air cap at the front of the gun introduce a low volume but high pressure, (40 – 60 psi. ), stream of air into the material to break it up and create a variable fan pattern. HVLP– High-Volume, Low-Pressure, is the standard equipment in use today in California. It atomizes the material in the same manner as the conventional gun, by introducing a stream of air into the material that is presented to the front of the gun. However HVLP guns use a larger volume of air at a lower pressure typically 10-20 psi. Reversing the relationship between pressure and volume. This system decreases voluminous overspray and saves materials. Compressors and Filters. Both of these spray systems need compressed air to operate. This air should be filtered as the action of compressing the air heats it up. While in the tank and hose, this air cools down. 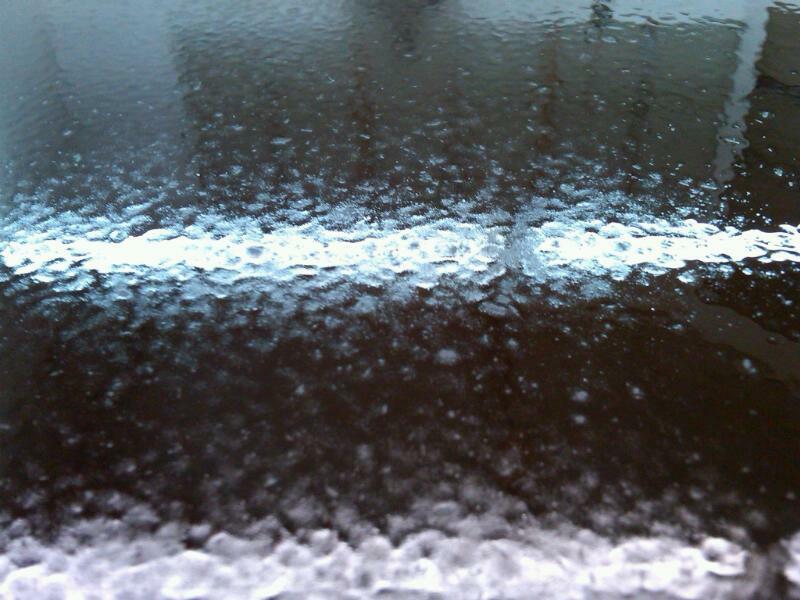 The moisture in the air then condenses in the tank and lines. In addition compressors will inject oil and other contaminants into the air supply. An oil and water separator / filter mounted close to the end of the airline is recommended. The compressor should be installed outside the building whenever possible. Remember it will be drawing air from the surrounding area you install it in and blowing it on your work. Spray cups / guns and spray pots. A siphon cup gun has a one-quart cup attached to the bottom of the gun. When you pull the trigger on the gun, air is released out of the air ports in the cap at the front of the gun. This air stream siphons / pulls material out of the cup. The vent hole at the top of the cup must remain free and clear to allow air to enter the cup so that the siphoning action can take place. A gravity feed cup gun is a new innovation in cup / gun design. The cup is mounted above the gun so that the force of gravity is used to bring the material down and present it at the front of the gun. You must keep the vent hole at the top of the cup free and clear to allow the material to drain into the gun. It is superior to the siphon feed cup gun design. Both siphon and gravity feed cup guns are best used for small amounts of material. Sample work, shading and toning procedures, etc. A spray pot is a two-gallon or sometimes five-gallon pot or bucket that has a pressure regulator attached to the top of it. The regulator allows air to free flow through to the gun to atomize the material, but it also pressurizes the material in the pot. Instead of passively siphoning or allowing gravity to feed the material to the front of the gun, the spray pot will deliver material under pressure to the front of the gun for atomization to take place. This will allow greater production as less air is needed to atomize more material. In addition greater capacity is provided by the two or five gallon quantity of material in the pot. Airless spray machines use a hydraulic pump to pressurize the material that is sucked up in a pick up tube from a five-gallon bucket. The material travels in a ½” diameter spray line that are available in fifty foot lengths. The material is forced out the front of the gun through a very small orifice or spray tip. This spray tip atomizes the material and shapes it into a spray fan of preset widths 3 to 21 inches wide. The big advantages to airless spraying are,1. Dispensing with the need for compressed air to atomize the material. You get straight material coming out of the gun without the cold, damp, dirty air that is delivered by most compressors. 2. A uniform spray pattern delivering a consistent amount of material all the time. This spray pattern does not require constant adjustment like the conventional and HVLP guns do. 3. It is a closed airtight system so that you may leave material in the spray rig and bucket for extended periods of time. 4. Only one material line too the gun allowing for more mobility. Excellent choice for high production shops. Spray finishing skills take a lot of raw gun time to be proficient at. You can speed this process up with proper training and coaching. A very simple concept I express to my spray man trainees is; Spray until the surface just gets wet, no more and no less. If you spray too dry, the material won’t flow and will be rough. If you spray too wet, it will and run and fall down vertical surfaces or pool and puddle. Your goal is to get the material to flow and become one even uniform coating with no orange peel, dry spots, runs etc. Always start from the up wind end of the work and spray away from you towards the face of the booth. You don’t want to spray into the airflow of the spray booth as this will leave overspray on previously finished parts and the spray man too. Shoot all edges first and try to shoot your best surfaces last. Cabinet boxes should be shot from top down, working from inside out and horizontal bottoms last. Lapping the material. The general rule of thumb is to overlap your spray pattern by 50 %. This is not set in stone. It can vary depending on the speed you are moving your spray hand. Just remember the basic principal. Spray until the surface just gets wet, no more and no less. Be sure to overlap the leading and trailing edge of a panel to apply a uniform coating to the edge. Six to eight inches away? Again this is a rule of thumb that is not written in stone. Hold the gun the distance from the surface that produces a coating that is just wet. Watch the material coming out the front of the gun. Don’t watch the gun or the surface you are spraying. Keep your eye focused on the material flowing out the front of the gun. This technique gives you a better perspective on how much material is being deposited on the surface. To live or die by your sample? Variations between samples and finished product are to be expected in natural materials that are assembled and finished by hand. This is a concept that your clients need to understand. It should presented in an educational manner so as not to offend or lead the client to believe you will not try your hardest to achieve the look represented by the approved sample. Variations in color and sheen of finish occur do to variations in natural wood colors, variations in porosity of different wood species, changing lighting conditions, etc. You should express to your customer that every effort will be made to achieve the overall effect depicted by the approved sample. This effort is what differentiates between custom finishing and factory produced assembly line finishes. Surface Prep – Filling nail holes and minor defects with solvent-based filler is the first surface prep step. You want to leave as little putty on the surface as possible as the filler is hard to sand. The entire surface should now be sanded with 180 grit sandpaper to remove residual putty, dirt, pencil marks, fingerprints etc. I recommend no fill paper as opposed to garnet. If your milling department is leaving too many saw and milling marks in the material, it should be improved. The milling department should be providing the finish shop with stain ready material. Stain Types and Their Uses. The two types of stain we will discuss today are oil based and water based stains. The basic difference between the two will be in appearance and safety. Water based stains and their related finishes are generally milkier or waxy looking compared to oil based stains. However the water-based stains are safer to handle and are more environmentally friendly, as they have no harsh solvents or oil in them. Oil based stains and their related solvent borne finishing systems will produce very transparent and clear stain finishes. Stain rags should be soaked in water in a closed container and disposed of according local regulations. Out Of the Can or Custom Mixed? Use out of the can stains provided by your supplier when ever possible to save time and maintain uniformity between samples and finished product. Mixing stains between stock out of the can stains to achieve a specific color is the next step in providing a custom color for your client. If you desire to take the next step in providing your clients with truly custom colors, you can dive into the world of custom mixing concentrated pigments into the appropriate stain bases. This process requires an understanding of color theory and how the basic ingredients relate to each other. To stain or to glaze? That is the question. Stain open grained woods like oak, birch and ash to achieve a more natural and transparent look. Glaze closed grained woods such as maple, cherry, pine and fir to prevent blotching and promote color consistency. Water based stains on raw wood tend to be blotchy and raise the grain. It is recommended to either glaze the stain over the sealed surface or spray shade the stain on the raw surface with the spray gun and leave it alone; that is no wiping. Glaze is stain medium that is hand applied, “glazed”, (with brushes or rags), over and in between finish coats. This is what differentiates the glazed, finish from a stain that is applied to the raw wood. This finish is typically applied to softwoods or closed grained woods such as, pine, fir, maple and cherry wood. “Glazing the wood”, provides maximum color control and prevents blotching. In addition glazing naturally highlights all details and distressing and creates that warmly aged patina exhibited by fine old furnishings and cabinetry. Prep for Top coating– Sand with 220 or 320 grit sandpaper. Rub with red scotch brite. Top Coating – We will discuss three types of finish today. Lacquer, conversion varnish and water borne lacquer. Solvent based lacquershave been the standard of the furniture and cabinet finishing industry for years due to their excellent clarity, ease of use and versatility. In California they are slowly being phased out as the SCAQMD has deemed them to have too many polluting compounds in them, (volatile organic compound or voc). In addition as they have decreased the voc’s in these products they have become harder to use and not as durable. Conversion varnishis the finish that I am most excited about recently. It is essentially a catalyzed varnish that offers the ease of use of lacquer while eliminating the number of coats applied to achieve the same film depth and appearance of lacquer. My standard eight-coat lacquer finishing process has been reduced to four coats of conversion varnish. In addition as this is a catalyzed finish it offers superior wear and tear and durability. This product sprays and dries almost like a lacquer but has the build and full-finished look of varnish. It is voc compliant. Water borne lacquer is the finish that we will be demonstrating today as it is the material that is used on a daily basis here at the Closet Factory. The paint industry has been continuously improving this product since the late eighties when the SQACMD pronounced that they would be slowly phasing out heavily voc laden finishes i.e. solvent borne lacquer. Many furniture manufactures and other heavy users of solvent based finishes relocated to Mexico and other U.S. states with less regulation during that time. Today some shops are returning and new shops are opening due to improvements made to these waterborne finishing systems. This is a superior product compared to what was available ten years ago and will continue to improve. The advantages of this product are, its very low voc content allowing shops in California to use this material virtually on an unlimited basis. The use of synthetic acrylic resins in this material yield a very durable non-yellowing finish product. In addition due to the minimal evaporative solvents in this material you need less applied coats to achieve an acceptable finish as compared to solvent borne lacquer. The primary disadvantage to this material is the drying time that is still slow compared to faster solvent borne finishing systems. The higher the humidity the slower the drying time. This slow drying time can be improved with warmer, dryer air ventilated through the shop. Heat lamps can be used for work that needs to be finished very quickly. Another disadvantage is the slightly milky or waxy appearance of the final finish detracting from finish clarity. Essentially all of the information provided pertaining to stain finishes as far as surface prep, priming, (which is basically the same step as sealing), prep for top coating and top coating are the same for painting. The materials are essentially the same with the addition of titanium dioxide and pigments to provide the color and hue. For holes, scratches and minor defects, I use colored wax sticks and putties that are available from furniture finishing suppliers. For larger repairs it may be less expensive to simply replace the part instead of spending hours on repair and touchup that may never be acceptable to the client anyway. Minor color touchups can be performed with colored dye stain markers available from furniture finishing suppliers and art stores. My most often-used touchup marker is a black Sharpie pen. Dab the pen onto the area to be touched up and quickly rub it out with your finger to blend into the surrounding surface before it dries. For touchups that require more than what a marking pen can provide; I use straight concentrated Universal Tint Colorants, (UTC). The dry powder touchup kits that are available are great but they are expensive. I use the UTC stain pigments because I stock them any way for the custom mixing I do. In addition they are ready to apply straight out of the can, thinned with a little paint thinner or naphtha if necessary. Feather outthe area to be touched up with 220 or 320 grit sandpaper. If you leave a sharp, distinct line between the raw wood area and the adjacent stain it will be very difficult to blend that new touchup into the existing stain color. To feather the area you must sand the affected area until the underlying raw wood color graduates slowly from the raw wood color into the fully stained surrounding area. Start applying colorthat is lighter than the surrounding color. Pad or stipple the color onto the effected area. Simply brushing color evenly onto the surface is usually ineffective as it appears like a paint smear. Padding and stippling the color on diffuses the color onto the surface. You want a slightly busy application that will blend the touchup into the surrounding area. Allow to dry for a little while then apply a couple of coats of finish. Apply your final color to blend in with the surrounding area again padding and stippling as necessary for texture. Apply finish. Rub out and polish to remove overspray and blend finish. Standard rub out materialsare 0000 steel wool with a good quality furniture cream or polish. A lot of polish and light rubbing is usually enough. If the 0000 steel wool produces a sheen that is to shinny try 00 wool; be careful not to rub too hard or you may remove your touchup. Buff with a clean rag. this materil is copy write protected, please feel free to print and use the data contained here in If you intened to re publish this material please contact Mr. Craven and gain his specific permission.